Nikkei is a Peruvian term for Japanese-Peruvian fusion. Peruvian harvest staples – such as corvina (bass), prawns, corn, potatoes, avocado, and tropical fruit – meet Japanese cooking styles. Typical nikkei fare includes tiraditos – basically Peruvian sashimi – in addition to sushi rolls that incorporate Peruvian ingredients, corn and potato causas topped with fresh seafood, and ceviches with Asian flavorings. Nikkei’s sister style is chifa – Peruvian-Chinese fusion, and its staple dish is “chaufa” – basically Latin chow fun. While one might expect nikkei and chifa to be a safer bet near the Peruvian coast, I was impressed by landlocked Cuzco/Cusco’s LIMO. The restaurant’s name refers to the variety of aji (chili pepper) most often used in ceviches. Not surprisingly then, LIMO specializes in nikkei fare and premium Piscos. It also offers its own spin on chaufa, tuna tartare, and more traditional Andean dishes, like a contemporary presentation of cuy (guinea pig). Located just off of the Plaza de las Armas, the building’s colonial facade belies the restaurant’s modern decor and sleek red walls inside. This combination of architectural styles is fitting for the type of cuisine it serves. Our group was exhausted from a very long day of touring that took us from Urubamba in the Valle Sagrado (Sacred Valley) to Macchu Pichu and back before continuing on to Cusco. At the end of that long day, we were grateful that our friend’s recommendation was still serving dinner after 10:30 pm. We were even more grateful that the food was excellent. 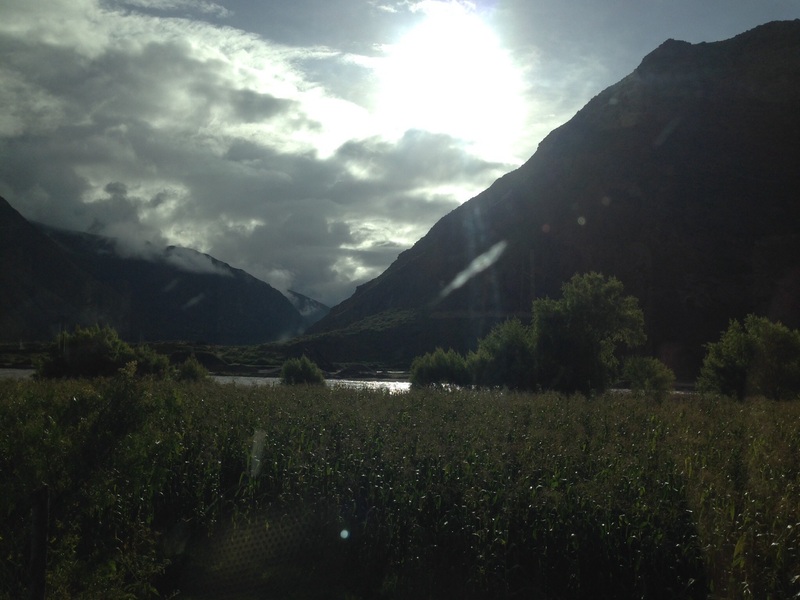 Our long day of touring included beautiful landscapes like this one. It’s easy to see why Peruvian food is so delicious – especially when you’ve worked up quite an appetite! A group of 12 that included two vegetarian teenagers and their vegetarian mother, we equally raved about each dish. My friends’ menu choices included traditional Andean fried yucca (“roots of the jungle” as another restaurant translated into English) with huancaina sauce, alpaca steak, various tiraditos and sushi rolls, vegetarian ceviche, causas, and other delights. For my own meal, I chose alpaca carpaccio and a vegetarian sushi roll that contained asparagus, roasted peppers, and onions atop a sweet and tart maracuya (passion fruit) sauce. The carpaccio was my first – and not my last – taste of alpaca. I was shocked at its tenderness and mild flavor – less like venison than I expected, imperceptibly gamey. I chose a maracuya and chile Pisco sour to accompany it, and wow, was it a powerful drink. 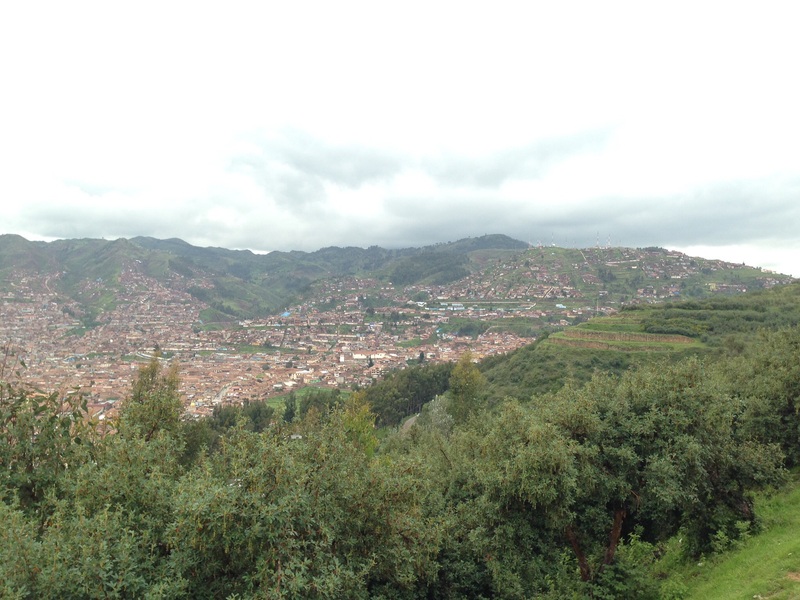 I’m sure the altitude of Cuzco had something to do with it, but one was more than enough, despite that it was one of the best I had. One friend and another’s son took up the challenge to try one of Peru’s hottest chiles (aji). I can’t recall which variety it was, but it may have been a rocoto pepper. As they were of Texan and Indian heritage, respectively, both were more than ready for the challenge; however, the pepper was much more deadly than anticipated. I’m used to seeing reactions to spicy food, but their reactions were priceless. They were both on the verge of tears, as was I – though laughing at/with them. Not because I would do better, but for two self-proclaimed heat lovers to become so flummoxed by the pepper was entertaining. For the record, I was smart enough to know not to chance trying it. Levity and spice challenges aside, the meal was no joke. 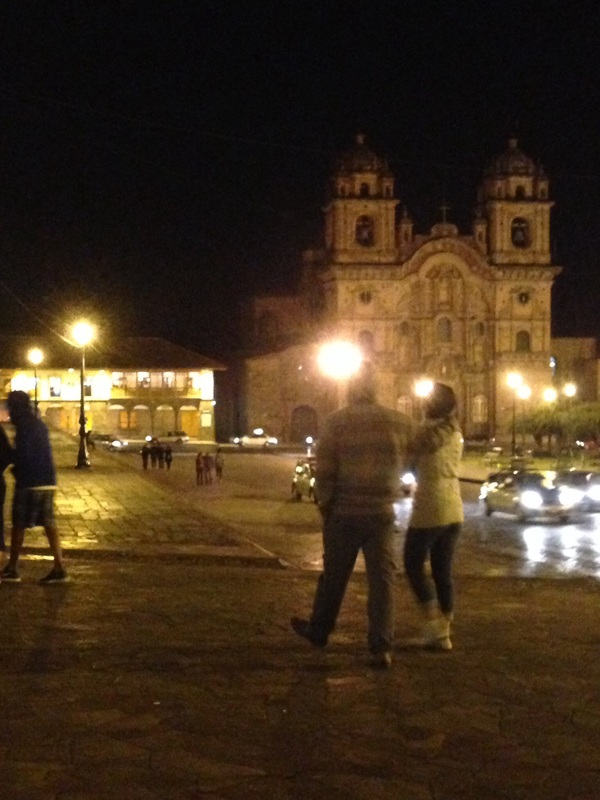 We left ready to sleep and fortified for another day of high altitude touring of Cuzco and adjacent Incan ruins. I highly recommend Limo. Though I may have had more critically acclaimed nikkei in sushi in Lima, LIMO’s creativity and balance between tradition and innovation made it one of my most memorable Peruvian meals. Next Post Pisco, national spirit of Peru…or is it?